This morning we jumped on to our own personal shuttle bus to the Radisson Hotel at the busy end of Music Valley Drive which runs parallel to the busy, noisy. interstate highway. From there we caught a city bus in to downtown Nashville. The weather was much brighter, but not having seen a recent weather forecast, took raincoats with us. By then it was late morning and as we’d bought a packed lunch with us to avoid eating junk food, we wandered down Broadway where the clubs are, then down to the Cumberland River where we found a picnic table and ate our lunch. Not only did it fill a gap, it meant I no longer had to carry it around in my backpack. After lunch the cameras came out and we made our way back up the hill towards Ryman’s Auditorium, www.ryman.com home of the Grand Ole Opry for many years. We paid for the self guided tour which was very enjoyable; there was even a member of staff down near the stage who was offering to take photographs of guests using their own cameras. Unfortunately we couldn’t look around backstage as there is a performance tonight by Tricia Yearwood, whoever she is, and her roadies were busy setting up the equipment on stage. Having a tourist trip over gaffa tape & cabling, then diving headlong in to the base drum was a risk they were clearly not prepared to take. Many famous C&W artists have performed on this stage as well as other well know names including Elvis Presley. The Grand Ole Opry moved from this venue in the 70’s to its current location out of town. 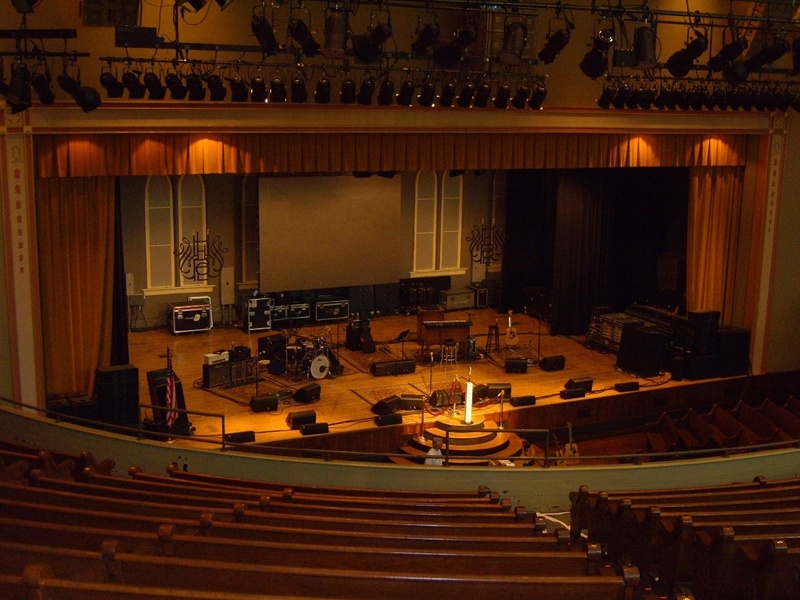 Ryman’s Auditorium then lay empty for around 20 years before it was refurbished and opened again as an historical venue in its own right. The weather during the day was improving all the time and was by now hot and sunny. We felt we’d seen all we wanted to see, and so opted for a cool beer in Tootsie’s bar & restaurant www.tootsies.net . Now I’m the last person to know what constitutes a good C&W singer, but the chap on stage sounded quite acceptable and kept us entertained for about an hour, before being replaced on stage by a young lady playing the fiddle with her boyfriend accompanying her, trying to light a fire by rubbing a pick against half a dozen strings, singing a song he’d written after having just met this new young lady in his life. We decided it was a good time to leave with The Chef commenting that perhaps the old songs are the best. When we got back to the RV we set about having an early barbecue as later The Chef would need to use the laundry for a large wash and I needed to get a Wi-Fi signal to send and receive emails. Tomorrow we need to be up early as I’ve booked the RV in next door to have a problem with the slide-out unit looked at, after which we’ll be making our way north. LOCATION TONIGHT: Two River Campground, 2616 Music Valley Drive, Nashville, TN 37214. I slept very well last night courtesy of our hosts Wal-Mart, perhaps because there were no noisy trucks running their engines on and off all night. The Chef, unfortunately, didn’t sleep as well. After showering and breakfast I popped back in to Wal-Mart for a tube of white exterior mastic in the hope the weather stays dry and I can run some across potential areas of leakage on the roof. I also bought a new cake icing bag so that we can make some more pork sausages. That done, we set out for the KOA campground on Music Valley Drive. It’s expensive at $60 a night but it provides a shuttle service to downtown which, without a tow car, is what we need. On arrival Rosina popped in to the office to check on the availability of the shuttle and came back out to say there was no such thing as a free shuttle, it was $5 per person each way and it didn’t run today as it was the driver’s day off. For $60 a night that was quite unacceptable, the besides the campground didn’t look that inviting, so we left. We ended up at the Two Rivers RV campground www.tworiverscampground.com just a few doors down where they only charge $37 a night, and it’s right next door to Cullum & Maxey an RV sales and service centre which is useful, as we’ve a problem with the slide-out which I’ll get them to look at whilst we’re here. 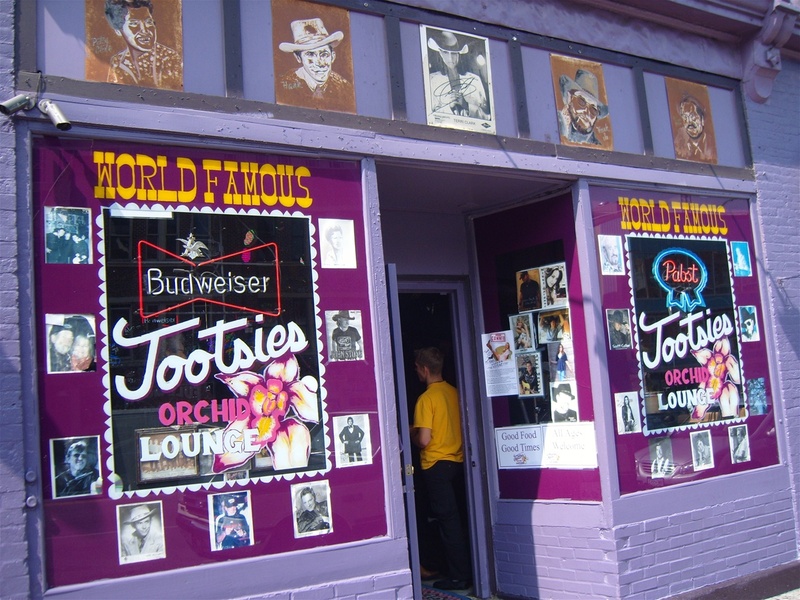 When we eventually arrived in downtown Nashville we had a general wander round, and by then it was lunchtime, so we bit the bullet and had a cheeseburger with fries. I have to say not only were the portions large but it was very tasty indeed, one of the best we’ve had in America, although we do try not to eat them very often. After lunch we went to the Country Music Hall of Fame Museum www.countrymusichalloffame.com . Opened in 2001 this $37 million dollar building has a front representing a piano keyboard which, let's face it, is a bit different. 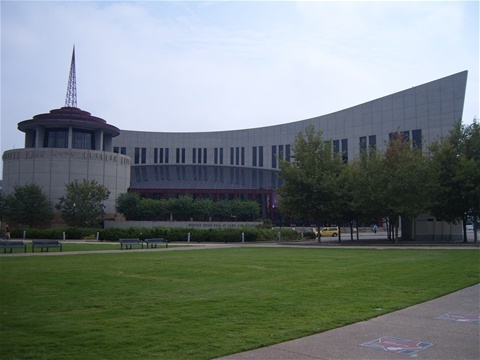 We had intended to look around the museum but had to concede we knew very little about Country & Western music and so most of the exhibits would have gone over our heads. I did explain to the lady at the ticket office that we’d heard of Johnny Cash, Roy Rogers & Trigger but that’s about all, so could we please just have tickets for the RCA Studio B Tour down the road? Indeed we could, and to help kill the 30 minute wait until the next tour I checked out the gift shop to see if they had any books by the famous C&W star Sad B. Astard, but alas no. There are slightly differing stories about the origins of RCA Studio B but it seems that when Elvis Presley’s contract was sold by Sun Record Studio in Memphis to RCA, Elvis complained that he was not prepared to commute all the way to New York to record, and so RCA created Studio B just for him. Before long other names began recording there, including Jim Reeves, Dolly Parton, the Everly Brothers and Roy Orbison, who, I learned today, was not blind, but cross-eyed, and so wore heavily tinted glasses to disguise the fact. So it seems he could safely stand near the edge of the stage after all. The studio tour was very interesting and we were allowed inside the actual studio where it all happened, having first watched a video of some of the artists recording in there. I even got to play with the very piano Elvis and many others used during those recording sessions. The piano has never left the building, although Elvis did express a wish to buy it and move it to Graceland. He was to record at Studio B from about 1959 to 1973, after which he recorded in Las Vegas and elsewhere. On our return from the recording studio we continued to wander around town passing the Schermerhorn Symphony Center www.nashvillesymphony.org opened in 2006 with classic architecture and sculptures in its grounds, and then came across a very wide footbridge crossing the Cumberland River. I had only just said to The Chef that we should check out the 'General Jackson Showboat' www.generaljackson.com when around the bend in the river it came, so we were able to take a few pictures of it as it passed under the bridge, turning round and berthing. We decided to make our way back to the campground as we thought there was some evening entertainment laid on there, perhaps even I could handle some Country & Western if it was free. Sadly on our return there was none, and so it was to be an evening indoors with me typing up diary notes and The Chef watching a snowy picture of some mindless television game show. I had hoped to have internet connection this evening but the Wi-Fi signal is too weak, it seems I’ll have to go down towards the laundry block to get an improved signal, which will keep me occupied tomorrow evening whilst The Chef gets some laundry done. 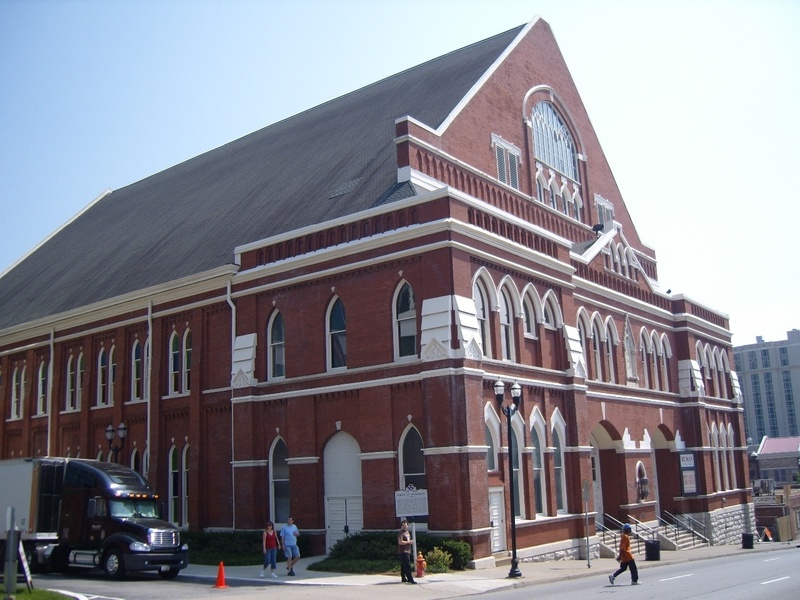 Tomorrow we plan to return downtown for a visit to the Ryman Auditorium www.ryman.com one of the former Grand Ole Opry sites before it moved out of town next to the Opryland Resort www.opry.com .